Although goat is hard to find and doesn’t come cheap in the U.S., there are plenty of ways to cook it and we think braised is the way to go. We love Goat, LOVE! Since Eid Al-Adha, an Islamic holiday that honors Abraham's willingness to sacrifice his son, passed a few weeks ago all we have been craving is goat. Around the world Muslim's celebrate this holiday by sacrificing goat/lamb to donate and share with friends and family. In Nigeria, Goat meat is pretty popular. It is used as the main meat in different kinds of stews and soups and as a side dish by itself, you name it. In the search to decide how to cook the meat, we stumbled upon this Bon Appetit article on braising meat. Although we used a slow cooker instead of a Dutch oven, the braising rules still apply and so our recipe was born. We seasoned the goat meat before we seared it in a cast iron pan. You want the goat meat to be browned on every side and to produce a wonderful glaze in the pan. Once you’ve seared all your meat, put it in your slow cooker. Now, add the ginger, garlic, onion, carrots, celery and chicken stock in the pan you just used to sear the meat. Make sure to deglaze the pan by using a wooden spoon to get all the brown bits stuck to the pan. Then pour the mixture over the meat in the slow cooker. Now, for the tomato sauce. In a separate saucepan, pour in the tomato sauce and half a cup of chicken stock to boil until it dries out a bit. Beware of splatter as the tomato sauce boils. Why do we do this? We think tomato sauce has a strong overpowering taste that only spoonful's of spice can erase. We don’t want the tomatoes being the only thing we taste, so we make sure to boil/fry off some of the taste. If this isn't a problem for you, feel free to skip the boiling section and just pour the sauce and half a cup of chicken stock into the slow cooker. We promise to judge you. Once done, you can choose to thicken the sauce by taking out the goat meat, blending the sauce and cooking in a saucepan till it reaches the consistency you desire. About 5-10 mins and you're ready to serve with rice, potatoes or even spaghetti squash! TMA Lesson: If you don’t have a cast iron pan, invest because it is a life changer. Season the goat meat with the Maggi, and half of the curry powder, salt and cayenne pepper. In a sauce pan, heat up the oil and sear the goat meat on all sides. If all the pieces don’t fit in at once, do them in batches. Once browned, put the goat meat in the slow cooker. In the same pan, pour in the ginger, garlic, onion, carrots and celery, sauté for a few minutes. Add 1.5 cups of chicken stock into the saucepan. Make sure to get all the glaze from the browned meat off the bottom of the pan and into the sauce. This glaze makes the braise more flavorful. After about 5 minutes, pour the vegetables over the goat meat in the slow cooker. In a separate saucepan, pour the tomato sauce and 1/2 a cup of chicken stock and leave to boil. Boil until the mixture has lost a bit of water and the "tomato" flavor is not as strong, about 15 mins. Beware of splatter. Pour the tomato sauce mixture into the slow cooker. Add in the remaining half of the curry powder, salt and pepper (optional) and mix all the ingredients lightly. 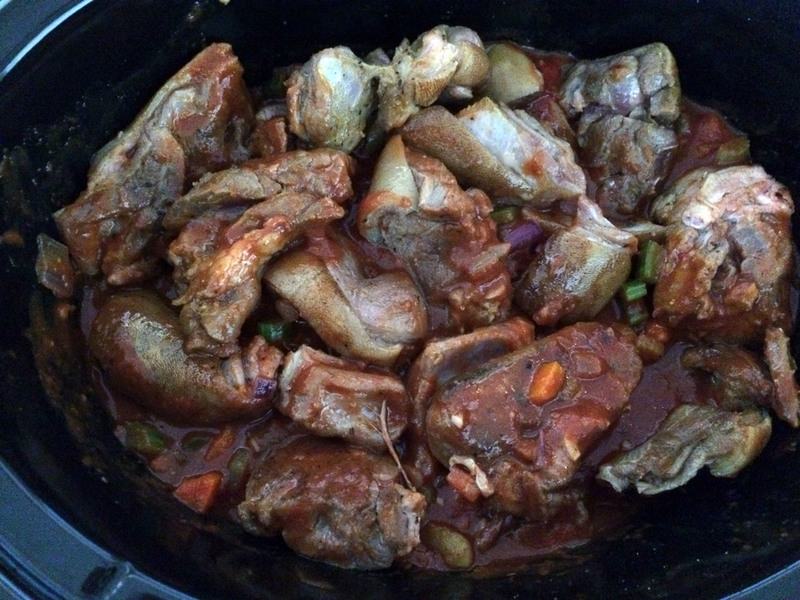 Turn the slow cooker to low and leave for 8 hours or until goat meat is tender and practically falling off the bone. To thicken the sauce, take out the goat meat and blend the sauce. Return the blended sauce into a saucepan and boil till it reaches your preferred consistency. Return the goat meat to the sauce. Note: Feel free to skip step 4 if you don’t mind that strong tomato taste. Get the goat meat here in Seattle + its Halal.